Triple Toucan Video Slot Guide & Review - Casino Answers! Triple Toucan is a 5-reel, 20-line Real-Series Video Slot developed by Realtime Gaming, featuring wild substitutes, expanding wilds, scatter wins, multipliers, a free spins feature and a progressive jackpot. You can play the Triple Toucan video slot game at US-friendly online casinos Winpalace Casino and Cherry Red Casino. Triple Toucan has a tropical theme mostly centered around birds. The video slot gets its name from the Toucan wild symbol that can triple your winnings. 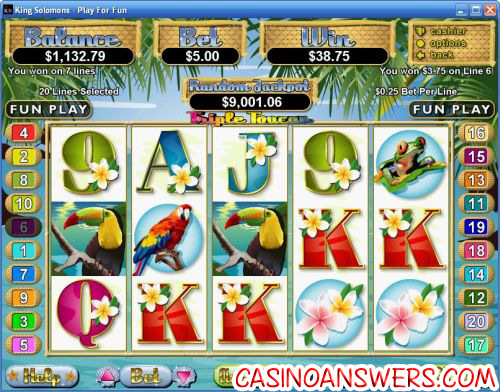 The video slot uses an array of tropical colours to go along with the colourful birds featured in the slot game. Symbols on Triple Toucan include: Toucan (wild symbol), Parrot, Tree Frog, Flower, Coconut, Ace, King, Queen, Ten, Nine and Fruits (scatter symbol). 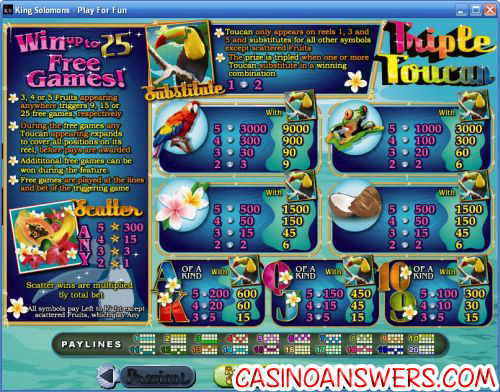 Triple Toucan features some upbeat tropical music that plays when you hit some of the winning combinations. There are also toucan sound effects when a winning combination includes the Toucan wild symbol. Use the arrows next to “Bet” to select a bet per line of $0.01, $0.02, $0.03, $0.04, $0.05, $0.06, $0.07, $0.08, $0.09, $0.10, $0.25, $0.50, $1, $2.50 or $5. You can also lower the number of selected paylines from the default of 20, but you run the risk losing out on many potential winning combinations if you decrease the number of paylines. The lowest total bet you can make on the Triple Toucan fruit machine is $0.01 all the way up to the highest of $100 per spin. Anyone can find their ideal wager on Triple Toucan, regardless of whether they are low or high stakes players. During any spin, you can hit the “Stop” button to use skill stop and halt the reels manually. To spin the reels, hit the “Spin” button in the bottom right corner. The Toucan symbol, which only appears on reels 1, 3 and 5, is the wild symbol on the Triple Toucan RTG video slot. It substitutes for all symbols except for the Scattered Fruits symbol. When one or more Toucan substitutes in a winning combination, your prize will be tripled. Triple Toucan has a 9000 coin top fixed jackpot. To win the top jackpot, you need 4 Parrot symbols and 1 Toucan symbol to act as a 3X multiplier. Without the Toucan symbol, 5 Parrot symbols will win you 3000X your bet per line. The Tree Frog is another significantly paying symbol in Triple Toucan; 4 Tree Frogs and a Toucan are worth 3000 coins. The scatter symbol in Triple Toucan is the Scattered Fruits symbol. Two symbols will pay your total bet, three will pay 3X your total bet, four symbols pay 15X and five symbols will pay 300X your total bet. Using the Scattered Fruits symbol, you can win up to 25 free spins on the Triple Toucan slot machine. If 3, 4 or 5 Scattered Fruits symbol appear anywhere on the reels, you will win 9, 15 or 25 free games. Tropical music will begin playing during the free games feature that will help raise your excitement to another level. During the free spins, any Toucan that appears will expand to cover the entire reel before prizes are paid out. Additional free spins can be won during the free spins feature. Free spins are played at the lines and bet of the triggering spin. Triple Toucan has a randomly triggered progressive jackpot visible above the game reels. It can be won on any spin you make on the game. Progressive Jackpot wins are added to other wins in the slot game. Random Jackpot contribution is no more than 1.5% total Return to Player. The Triple Toucan progressive jackpot is won frequently, so you can be the next big winner! At this moment, the Triple Toucan Random Jackpot is at a sweet $9,005 and rising steadily. You can try and win this progressive jackpot now at Winpalace Casino! Hit the “Autoplay” button to enter the autoplay mode on the Triple Toucan Real-Series Slot. Using autoplay, you can set the number of spins (up to 1000), stop autoplay when the jackpot is won, stop if a win exceeds or equals (up to $99,999.99), stop on any win, stop if your balance increases by (up to $99,999.99), stop if your balance decreases by (up to $99,999.99) or stop once free spins feature is triggered. You can stop the autoplay mode on the Triple Toucan slot machine at any time using the “Stop Auto” button. You can find the Turbo Play mode in the autoplay options. The Triple Toucan video slot either makes us want to go on a vacation to the tropics or eat a bowl of Fruit Loops, but either way, Triple Toucan makes for an enjoyable online casino experience. The Toucan symbol is very valuable but isn’t by any means rare. The free spins feature is also great, largely due to the expanding wild symbol. To play Triple Toucan, make your deposit today at Winpalace Casino! Can American players play Triple Toucan for real money? Yes, American players are welcome to play the Triple Toucan video slot at most Realtime Gaming casinos listed on this website, including two of our favourites, Winpalace Casino and Cherry Red Casino. If I’m from outside the United States, where else can I play Triple Toucan? Slots players from outside the United States of America can also play Triple Toucan at King Solomons Casino. How much can I win playing the Triple Toucan slot game? Betting the maximum $5 per line, you can win up to $45,000 playing the Triple Toucan slot at Winpalace Casino. What casinos have the Triple Toucan slot machine? Where can I play the Triple Toucan Video Slot game for free? Is there a Triple Toucan Slot Flash Game?